A normal operation of the hearing aid can bring great benefits for the hearing impaired, hearing aid accessories can help you get the best benefits you have hearing aids. Hearing Aids Moisture Beads is mainly used to absorb moisture from your hearing aid, prolonging its lifetime and increasing its sound quality. Hence, it must be replaced regularly. Before going to bed, it should switch off your hearing aid, remove the battery, and place the hearing aid (with the ear molds) inside the air-tight seal box with the hearing aids moisture beads. Your hearing aid can be used again in the next day. Hearing Aid Dehumidifier not only offers superior dehumidifying function but also enhances the hearing aid sound quality, hence greatly reducing the number of repairs. Moreover, the built-in UV light can kill 99% of common bacteria in the ear canal and reduce the infection caused. Disinfection spray can effectively eliminate the accumulation of bacteria in the ear mold or hearing aid shell to keep good hygiene. Before going to bed, it should use it on a dry cloth or paper towel to wipe the ear mold or hearing aid shell. It should conduct a weekly thorough clean on the ear mold to keep good hygiene. For cleaning the ear molds, you may apply a small amount of detergent, soak it for ten minutes, and then wash it with water. After flushing the ear molds, you may use earmold pump to eliminate the water inside. When the ear mold is dry, you may continue to use the ear molds and headset. Ear wax build-up can fully or partially block sound output and cause your hearing aid to underperform. By using an ear wax guard, you can protect your hearing aid from ear wax build-up, and maintain its performance. It needs to clean daily by a special tool (supplied with hearing aids). We recommend you change it if you can visibly see a build-up of wax, or you notice the performance of your hearing aid deteriorates. We suggest you check it on a daily basis. 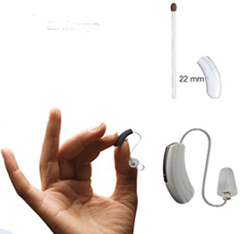 To learn more hearing aid information, please refer to: : About Hearing Aids, Hearing Aid Parts, Hearing Aid Styles.